Sunday May 29 - Page 2 - Ontario Storms Site! Anyone getting any storms yet? Nothing here in St. Catharines except for cloudy skies. Temps seem to have risen a bit, and humidity has gone up. I was just out walking said new dog in Mississauga: At the start of the walk, I could see the sun through clouds to the West, but it got dark fast. Clouds were not terribly defined overhead and moving slowly. High humidity, no wind to speak of, not even a breeze. Planes taking off from Pearson Airport were making left turns and heading south. Looking out at Lake Erie from Amherstburg. There's a reason they call niagara the electricity capital of canada, and its not just niagara falls and the hydro plant. 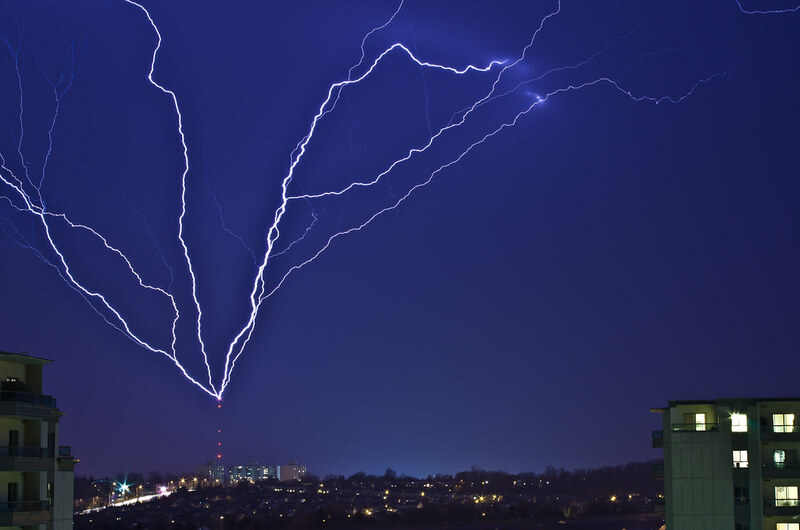 I think that because thunderstorms are fewer and farther between, we build alot of static in the ground. Last edited by obwan; 05-29-2011 at 10:49 PM. Thanks slacker, great shot. nice to see some form to the storm. As nasty as it seemed because of all the lightning, it really wasn't that bad. Almost ZERO wind. Heavy rain as it was over head, but aside from the lightning it wasn't as bad as it looked on radar. Last edited by DarkSky; 05-29-2011 at 11:21 PM. St Catharine's, by the hospital, 6th floor balcony. Wonderful view of a great Lightning Storm. Video has been cut out with the best stuff i filmed, to cut down on, idle sky. Taken with my digital camera, Best thing i have at the moment. Awesome video StormFreak! Great editing job too. I know how time consuming it is with lightning video. (I used to pull all the best parts back when I started in '98, but just don't have the patience anymore! ) You've got an awesome vantage point. Keep 'em coming on future lightning storms!